Please note - this area is on private property, so please do not trespass, thank you. 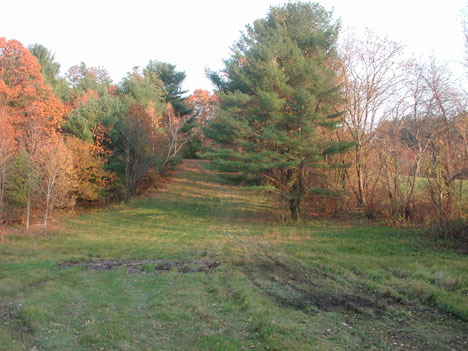 Southwick Ski Resort was a classic rope tow area that operated from 1962 to 1973. The area was owned and operated by Frank and Julia Zomek. 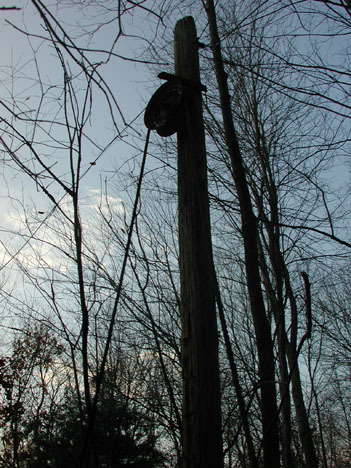 The ski area operated with two rope tows on a 100-150' drop, just north of Rte 57 in Southwick. The area closed around 1973, due to higher insurance premiums and likely the energy crisis. The property was sold shortly thereafter to the current owners, the Cecchinis. They did not operate it as a ski area. For a more detailed history of the area, continue below. Jeff Kellogg grew up near the area and has the full scoop. 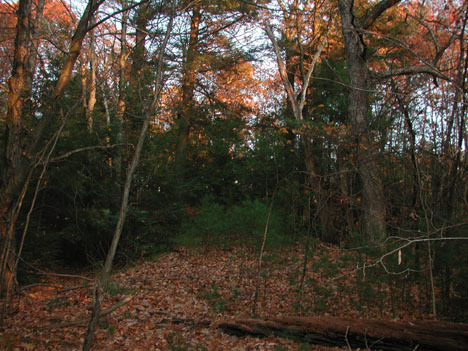 Jeff explored the remnants of the area with me on November 5, 2005, and pointed out many of the features of the area. The owners were kind enough to give us permission to explore. Here's an overhead view of the area today. As you can see, the area is fairly hard to detect unless you know where you are looking. 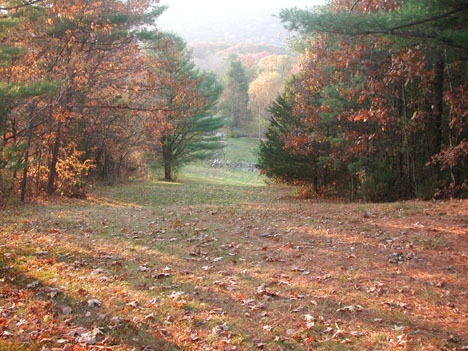 The cleared area to the far right is a meadow and is not part of the ski area. You can see the first tow line at the far right. The slope it served is still fairly clear as you can see in the pictures below. 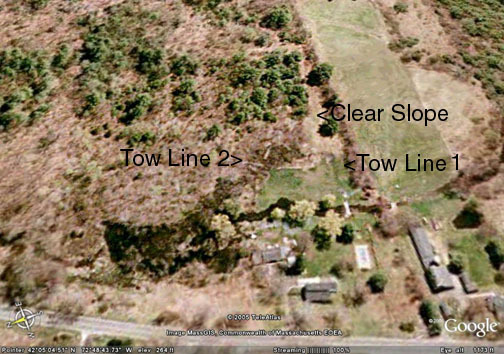 The second tow line is very hear dto see in this picture, as it its totally overgrown. Most of the trails it served are totally overgrown as well. The base lodge is still standing, and is the building to the left of the swimming pool. The following are current photos of the area taken on November 5, 2005 by Jeremy on the guided tour from Jeff Kellogg. The memories told are his, and detail the history of the area quite well. We hiked up the main slope, walked along the top, then hiked down the second tow. Looking up the one still cleared slope. Rope Tow #1 is visible along the edge of the trees on the right. One small area known was, believe it or not, Southwick Ski Resort. 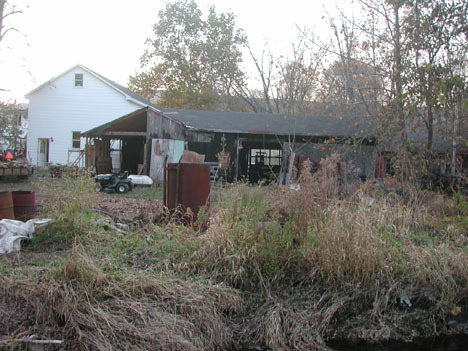 It was located approximately 3/4 of a mile north of route 57 on North Loomis Street, and was owned by Frank and Julia Zomek. I'm not sure about Julia, but Frank passed a number of years ago. They had a son, David, who still resides in Southwick. (and two other sons). 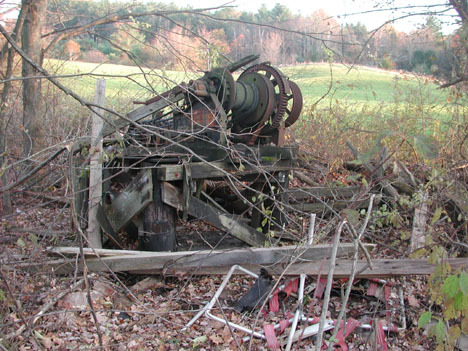 The remains of the machinery for the first rope tow. The ski area, which was directly across the street from my boyhood home, opened in 1962, when I was 5 years old. 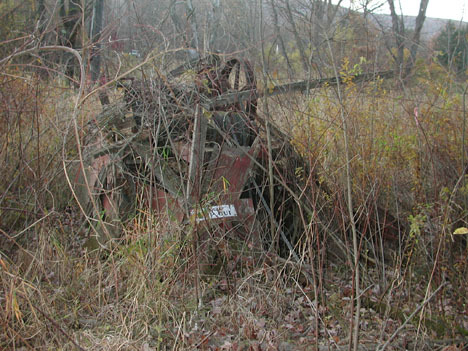 It consisted of two tractor-driven rope tows, and 5 trails. Most unusual in my opinion was the fact that, especially for such a small area, it had snow-making capabilities, even before most larger areas were doing so. 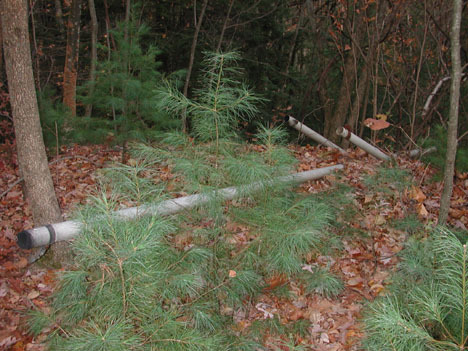 Frank was in the construction business, and had access to the large compressor needed, and also had a substantial brook running through the property, so water was abundant. There was a lodge with two fireplaces, snack bar with grille, and ski shop. Looking up the still cleared slope. Looking down the main slope. Rope tow ran up the left side. Given our proximity to the area, the children in my family were granted free skiing in exchange for various duties. As a very young child I bussed tables, emptied trash, and hauled wood for the fires. As I grew older, I maintained the towpath, helped with the snowmaking (sometimes through the night during school vacations), gave lessons, and was a member of the ski patrol. All in all, the area was probably the most significant positive experience of my childhood. Snowmaking pipe at the top of the second tow. 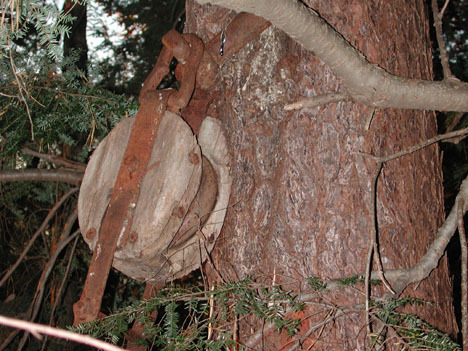 Second rope tow pulley mounted to a tree. 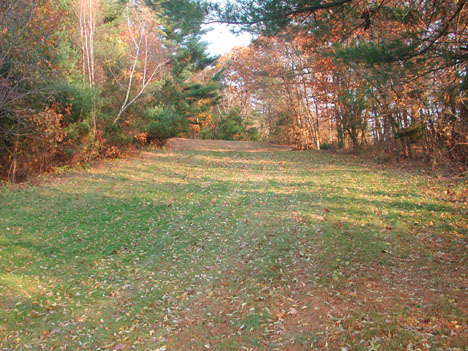 During its heyday, the parking lot would be packed, with many cars from Connecticut, probably 150 skiers on a good Sunday. Use began to decline in the early '70s, and I would guess its last year of operation to be the winter of '72 - '73. I remember Frank commenting on the rising costs of liability insurance; that may have played a role in the closure decision. Looking up the overgrown second rope tow line. 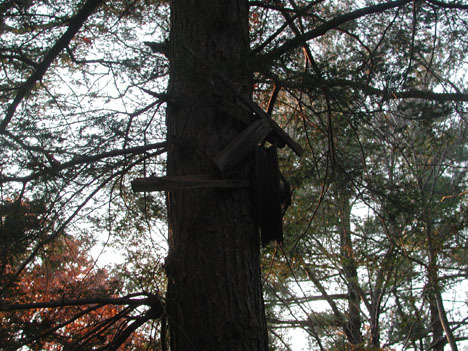 Another pulley on the tree. 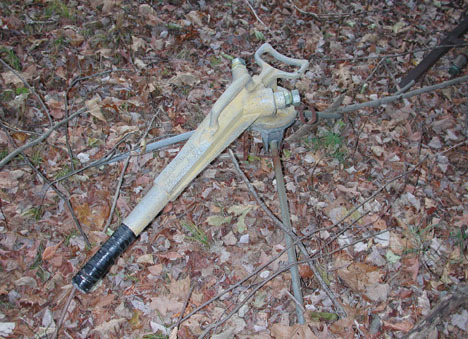 A vintage Larchmont snowmaking apparatus was found near the base of the second tow. Bottom tower for the second tow, note the still attached rope! Machinery for the second tow. Note the "Keep Out" sign still attached. Base lodge is still standing but is now a workshop. The large fireplace was removed. The funniest memory we have was a friend of ours would brag about how great his skiis were. No matter what he had it was always "a little better" than what anyone else had. (Back then we had wooden skiis, with metal edges if we were lucky. ) Well one day we saw a pair of skiis exactly like his - nailed to wall for decoration! We still laugh about it to this day. LTC Steve Spelman, 10th Special Forces Group: When I saw the pictures on your website, it brought back the memory of getting a hot chocolate there on a very sunny day. This resort was a very short drive from where we lived in Westfield, the town next door. I remember going there with my family and sometimes with friends.